The second phase of I-Berhad's integrated commercial development in Shah Alam, Selangor, is expected to kick off later this year, its top executive said. Chief executive officer Eu Hong Chew said the phase covering 3.64ha has a gross development value (GDV) of over RM150 million. It will offer between 300,000 sq ft and 400,000 sq ft of office space. The construction cost will be between RM30 million and RM40 million and completion is due in 2013. 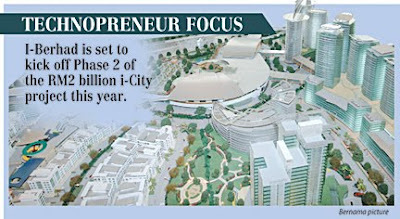 "The idea behind phase two will be to support (a) technopreneur campus concept," Eu told reporters after a visit by former Prime Minister Tun Dr Mahathir Mohamad to i-City yesterday. i-City is a 29ha RM2 billion project that boasts broadband speed of 20Mbps, with fibre optics network and a back-up power supply. The first phase, comprising 6.1ha of land with 500,000 sq ft of office space, is now 60 per cent occupied. I-Bhd plans to complete the Cybercentre office suites, also known as CityWalk South, during the second phase. It plans to build office towers and a one million sq ft shopping mall in future phases as well. According to Eu, i-City aims to attract Silicon Valley based companies that are looking to expand overseas. Apart from i-City having a technologically advanced state-of-the-art infrastructure, the Selangor state government also will focus on other elements of the Silicon Valley-like ecosystem. This includes developing the entrepreneurial talent pool, organising programmes to connect entrepreneurs with venture capital partners and getting universities to play a higher level of support for industries. "They have the business model and technology but may not be relevant in this market. So, they are looking for joint venture partners to localise for them so that when they go for an initial public offering their value will be higher," he said. 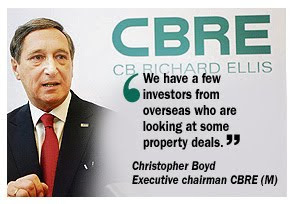 CB RICHARD Ellis (Malaysia) Sdn Bhd (CBRE), a real estate services company, expects the number of property transactions in the country to improve this year, thanks to a new wave of interest from local and foreign institutional funds. Executive chairman Christopher Boyd said there is strong buying interest from Singaporean, Hong Kong, Korean and Arab investors, looking for new office buildings in the Klang Valley and Penang. "Interest comes from as far as Ireland. They (investors) are core funds looking for completed and well-tenanted buildings in recognised locations. This augurs well for the rental market," Boyd said after a ceremony to mark the change of name of Regroup Associates to CBRE in Kuala Lumpur yesterday. He said there is a possibility that the value of property transactions in the Klang Valley will exceed RM4 billion this year as it expects more than 30 major deals. There were 28 major transactions worth some RM3.5 billion in the second half of 2009, involving purchase of land, office buildings and residential towers. A bulk of the buyers were local funds, including the Employees Provident Fund and Permodalan Nasional Bhd, and developers eyeing expansion. "We have a few investors from overseas who are looking at some property deals. They are international funds with huge capital to spend," Boyd said. Boyd also warned property developers to be cautious over the next six to nine months of over-launching their commercial projects as there is a strong possibility of a double dip in the West in the second half of 2010, which may impact the Southeast Asian market. "Developers will be tempted to think it's all over but it's too soon to think that. While we don't anticipate a crash, we are also not expecting any major upturn. But overall, we expect the market here to be stable in terms of capital value and rental value," Boyd said. He added that said average rental rates of commercial space in Kuala Lumpur remains stable at RM6 to RM6.50 per sq ft, although it is 15 per cent lower from a year ago. Rentals for Grade A offices stood at RM7 per sq ft as at the end of 2009. Office capital values are expected to remain steady throughout 2010 at between RM800 and RM1,200 per sq ft. Earlier, Regroup changed its name to CBRE after signing an affiliate agreement last December with CB Richard Ellis Group Inc, a US-based real estate corporation. Malaysia’s Mah Sing Group Bhd aims for property sales to climb 39 per cent to RM1 billion (US$292 million) this year as an economic recovery spurs home purchases in the Southeast Asian nation. The nation’s fifth-largest property developer sold RM720 million worth of properties last year, beating a target of RM453 million, managing director Leong Hoy Kum said in an interview in Kuala Lumpur yesterday. The impact of a possible increase in interest rates on property transaction will likely be minimal, he said. “This year will be a good year; our engine is going to ramp up again,” Leong said. Loans approved for Malaysian home purchases rose to RM7.3 billion in November, the highest recorded in 2009, central bank data shows. Malaysia’s central bank said on Jan. 26 borrowing costs can’t be kept “too low” for too long as growth strengthens, signaling it may raise interest rates sooner than some economists forecast. “The tone of the central bank has raised concern there will be a slowdown in demand for loans,” said Ang Kok Heng, who oversees US$150 million of investments as chief investment officer at Phillip Capital Management Sdn Bhd. He said he doesn’t expect an increase in rates this year and property demand will probably rise. Mah Sing spent RM323 million buying 184 acres of land last year to take advantage of “reasonable” asset prices when the Southeast Asian nation slipped into its first recession in a decade. The company is betting that an economic recovery spurred by RM67 billion in government stimulus measures will increase demand for new homes and offices. Mah Sing’s total revenue surged almost fivefold in the past six years to a record RM1.2 billion in 2008. Third-quarter profit rose 42 per cent to RM23.5 million from a year earlier. Shares of the Kuala Lumpur-based company climbed 15 per cent last year, falling short of the 45 per cent in the benchmark FTSE Bursa Malaysia KLCI Index. The company will this year begin selling nine property projects with a gross development value of RM3.4 billion, Leong said. The company aims to expand in markets including Vietnam, Australia and Singapore. Mah Sing in December agreed to form a venture with Danlong Realty (Beijing) Ltd. to develop a property on 87.31 acres in the city of Changzhou in China’s Jiangsu province, which will cost about US$620 million. The estimated sales value of the project, of which Mah Sing owns 51 per cent, is more than RM3 billion, Leong said. “As long as you are targeting the real market demand and you don’t go to areas like Beijing or Shanghai” the market is not in a bubble, he said. The company is seeking land acquisitions and is preparing a RM1 billion “war-chest” for purchases in Malaysia and overseas, he said. Leong said he wants to boost Mah Sing’s market value of about RM1.3 billion to RM5 billion within a couple of years. That would exceed the current worth of SP Setia Bhd, the country’s biggest developer by value. PETALING JAYA: Sime Darby Property Bhd is in discussions with a few potential partners for possible joint ventures (JV) to develop its vast land bank in the country. The company has a land bank of 37,000 acres, of which 8,000 acres are in the Guthrie Corridor, according to managing director Datuk Tunku Badlishah Tunku Annuar. “It is the company’s strategy to team up with strategic partners to develop the land bank. “Besides the advantage of sharing the expertise and knowledge, it will also allow us to realise the value of our land in a shorter time,” Tunku Badlishah told StarBiz yesterday. He said the company’s first JV was with the Brunsfield group. The 60:40 JV, with Sime Darby Property holding 60%, was established in 2006. It has undertaken three projects to date – the RM250mil Subang Avenue, the RM550mil Oasis Damansara and the redevelopment of Oyster Cove, one of the most exclusive waterfront resorts on Australia’s Gold Coast. On Tuesday, Sime Darby Property signed a 50:50 JV agreement with Sunrise Bhd to undertake a RM1bil integrated commercial property project in Bukit Jelutong, Selangor. To be launched and developed in five phases from 2011, the commercial development on 21 acres will have a total built-up area of 2.7 million sq ft, consisting of retail lots, shop offices, office suites and serviced apartments. On the latest JV, Tunku Badlishah said the partnership would pave the way for the sharing of expertise and know-how between Sunrise and Sime Darby Property. “We see a strong synergistic alliance with Sunrise. While we have successfully build the residential component, Bukit Jelutong still lacks in its commercial offering. “Sunrise’s expertise in commercial development will come in handy to further add value to the whole project,” he added. Launched in 1996, Bukit Jelutong is an upscale residential enclave in Shah Alam which is home to 25,000 residents now. ECM Libra property analyst Bernard Ching noted that while the existing township consisted mainly of terrace, semi-detached and bungalows, there was no significant high-rise residential and commercial development. “As such, we believe there is a captive market for the product offerings proposed by the JV. “Sunrise’s expertise in commercial development and high-rise residential projects is a good fit to bring in. It is very likely that the Bukit Jelutong project will be lifestyle-oriented, which is still largely absent in Shah Alam,” Ching said. “With this tie-up, Sunrise will have the opportunity to replicate its success in developing Mont Kiara in another prime location,” he added. Hwang DBS Vickers Research property analyst Yee Mei Hui said the JV would be a win-win situation for both partners as they could tap on each other’s strength and expertise. “If it turns out well, this may be the start of more partnerships between Sime Darby Property and other property players,” she added. KUALA LUMPUR: CB Richard Ellis Malaysia Sdn Bhd (CBRE) expects office rentals in Malaysia to stabilise in the first half of 2010, barring any major economic setbacks. “Office rentals in Kuala Lumpur peaked at the end of the fourth quarter of 2008 and softened by about 15% as at the end of the fourth quarter of 2009. “Rentals for Grade A offices stood at RM7 per sq ft at the end of 2009, similar to the first quarter of 2009 level,” according to a special report by CBRE Research. Vacancies and rentals began to level out in the fourth quarter of 2009 as was witnessed in comparable cities around Asia as the market downcycle approached its end and leasing activity gradually picked up across the region. Despite the addition of 4.76 million sq ft of new supply from 14 office buildings completed in 2009, vacancy rates stabilised at 13% by year-end as the bulk of this new supply was non-speculative and had been significantly pre-let prior to completion. New supply set to come on stream over the next three years will continue to make for a highly competitive leasing environment and further improve the city’s appeal as a location in which to do business. CBRE expects continued broad-based demand across a wide range of sectors including Islamic finance, oil and gas, agribusiness and commodities. Executive chairman Chris Boyd said the combination of modern infrastructure, quality facilities and comparatively cheap rentals made Kuala Lumpur a highly attractive location for any prospective multinational considering a move. “Kuala Lumpur offers a consistent cost advantage which is not a flash in the pan, as growth in the supply of new buildings serves to smooth any potential fluctuations in rental levels,” he said. CBRE feels that the market has not yet experienced the full impact of the last budget announcements which further liberalised the acquisition of property investments by foreigners. “With no requirements for local equity, we expect to see an increasing number of overseas institutions seeking investment grade property in Malaysia in 2010 and beyond,” said executive director Paul Khong. “Kuala Lumpur offers a wide choice of buildings and locations at rentals which are going to remain extremely competitive in the foreseeable future,” added managing director Allan Soo. 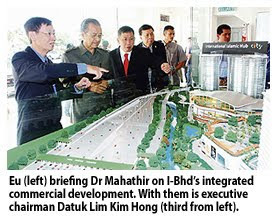 A 352-room hotel, an exhibition and convention centre along with commercial lots will form the third and fourth phases of the RM1.1 billion Penang Times Square development in Penang. The project, which is being carried out by Ivory Properties Group, will also feature a cineplex and luxury condominiums, its executive director Datuk Seri Nazir Ariff Mushir Ariff said. "We are talking to several parties and hope to sign up with an investor for the hotel by the end of the year," he told a media briefing in Penang yesterday. Nazir said it will either get the investor to buy up the 325-room hotel, or get a long-term operator to manage it. "The proposed four- or five-star hotel will occupy 0.96ha of land and we intend for it to house resort and spa facilities and services." The property developer, which is awaiting final approval from the Securities Commission for an initial public offering, will launch the shopping mall portion of Penang Times Square on February 6 under the first phase. On the proposed exhibition and convention centre which comes under the third phase of the project and set to break ground by 2012, Nazir said: "Our plans are for it to occupy 80,000 sq ft, but if necessary we can expand it up to 150,000 sq ft and this will give us a pillarless convention hall. "We also hope that the hotel operator will be able to run the convention centre in order to ensure that high standards are maintained." Penang Times Square sits on 5.2ha site where one of the country's oldest smelting operations - Escoy Smelting Sdn Bhd - once stood. About 0.8ha has been earmarked by Ivory Properties for an urban open space and heritage museum. On the shopping mall, Nazir said that after Chinese New Year, the retail outlet should be 65 per cent occupied. Its anchor tenant is Sunshine City, which belongs to the Sui Wah group of firms. "Apart from Maybank, which is moving in to the mall, new tenants include a travel agency and an amusement centre," Nazir added. KUALA LUMPUR: SUNRISE BHD posted net profit of RM34.52 million for the second quarter (2Q) ended Dec 31, 2009 and is upbeat for the remaining second half due to the locked-in unbilled sales of RM714.1 million as at Dec 31, 2009. It said the board was confident of the company's prospects in the current financial year ending June 30, 2010 due to these unbilled sales while it also had in the pipeline other projects ready to be launched. "Profits from these future billings would be recognized substantially over the current and the following financial year," it said on Thursday, Jan 28, when announcing its results. Revenue was RM158.32 million in 2Q while earnings per share were 6.97 sen. It added the company recently soft?launched 28 Mont'Kiara, a luxury condominium development in Mont'Kiara. It said response was positive with bookings received for about 200 units. "The company has a pipeline of other projects ready to be launched, including a commercial development in Kuala Lumpur, depending on market conditions. Sales from 28 Mont'Kiara and the new planned projects will sustain the company's longer?term profits," it said. For the first half ended Dec 31, 2009, net profit was RM71.78 million, which was 13% lower than the RM82.48 million a year ago which had included a one-off gain of RM19.4 million from the sale of office space in Plaza Mont'Kiara and an Australian asset. "Excluding these one?off gains, the company's underlying net profit for the current period would have risen 14% year-on-year," it said. Revenue was RM348.58 million compared with RM401.35 million a year ago. Sunrise said its earnings were sustained by progress billings for its ongoing developments, namely 10 Mont'Kiara, 11 Mont'Kiara and Solaris Dutamas, as well as strong sales of the completed Mont'Kiara Residence bungalows. PROPERTY developer Sunway City has hired RHB Investment Bank and Credit Suisse as the main coordinators for the planned listing of its real estate investment trust (REIT) in Malaysia, sources with knowledge of the deal said yesterday. The listing of the REIT, the biggest ever in the Southeast Asian country, is likely to happen in the first half of 2010 and the company may raise about RM1 billion in its public offering, one of the sources told Reuters. "The REIT will have a market capitalisation of more than RM3 billion, " said one source. Credit Suisse will act as the international global coordinator, while RHB will handle all domestic issues. Sunway City was not immediately available for comment, while RHB and Credit Suisse declined to comment. Sunway City, valued at US$440 million (US$1 = RM3., said last year that it may revive the plan to float its property assets in 2010 depending on the recovery in markets.